Everyone who gets this joke wins the Internet. All of it. 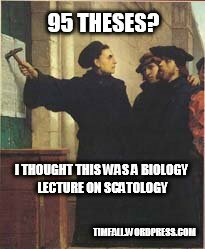 This entry was posted in Uncategorized and tagged humor, Martin Luther, Reformation Day, Wittenberg Door. Bookmark the permalink. I think I get it – does it relate to the fact that my son pronounces THursday as Fursday? You win! You should probably split the prize with Jonathan, don’t you think? The misunderstood term, however, might have become of the actual object of concern after the Diet of Worms. Full of nutrition, but sometimes a little hard on the GI tract. Gotta watch them tracts. pfff. took me a minute.